I’ve had the opportunity to learn all of the major sales systems over the past thirty years. There is merit in every sales methodology. Yet, in training my own teams and in training for others, I have found that regardless of the approach and sales methodology there is a consistent set of challenges that continue to crop up. It never fails, one or more of these challenges will make its appearance in the middle of whatever workshop you are conducting. They are important and often immediate needs for sales professionals. Yet the irony is that they fall outside the scope of virtually all the major sales systems. They live in a strange sort of no-man’s land – too specific to be addressed by a general methodology and too complex and time-consuming to be covered in a public offering. And as a result, they rarely get addressed. 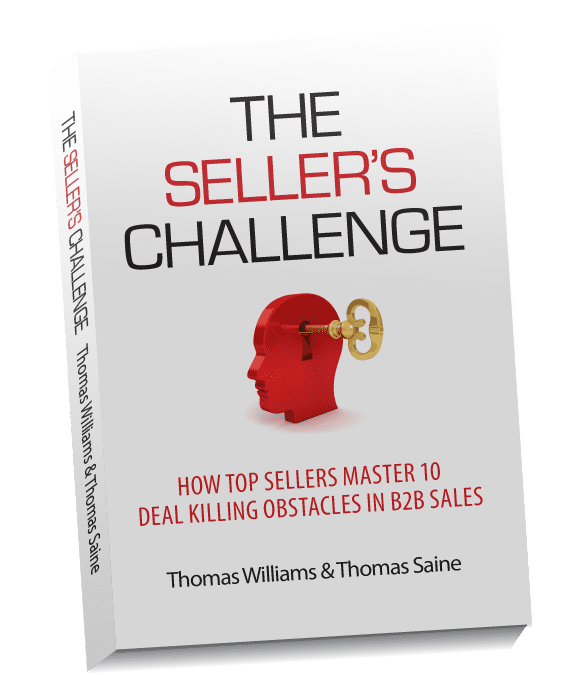 This is why I was so excited to see that Thomas Williams and Thomas Saine had collected and written a best-practices guide for the top ten of these important-but-rarely-addressed challenges for sales professionals. 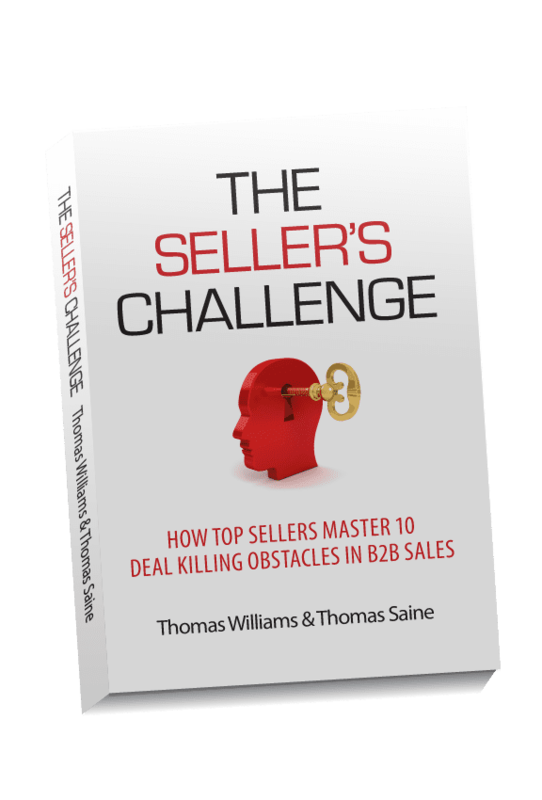 That guide is THE SELLER’S CHALLENGE – HOW TOP SELLERS MASTER 10 DEAL KILLING OBSTACLES IN B2B SALES. 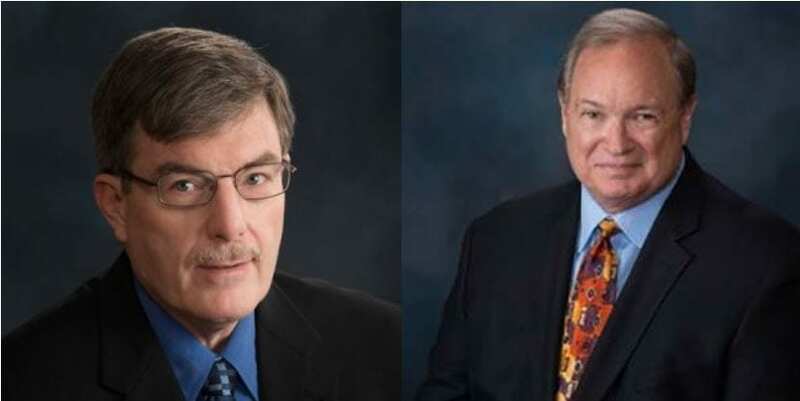 Both Tom Williams and Tom Saine hail for the B2B sales world where managed and sold in the trenches for many years. Additionally, Tom Williams has the rare quality of having sat on both sides of the table as a success sales professional as well as the CEO of two specialty hospitals. This provides the reader with a buyer’s perspective that is both unique and difficult to find in other books. I found these real-world insights very valuable and enjoyable to read. Additionally, there is typically one or two addenda at the end of each chapter illustrating how to implement the best practice in a real-world story and they often contain valuable reference materials such as additional resources and checklists. If you have ever read great works like Strategic Selling, SPIN Selling or The Challenger Sale you will appreciate (like I did) how The Seller’s Challenge complements these classic systems. It’s everything I look for in a book – it’s practical, actionable, explains the “why” behind the recommended practices and delivers everything necessary to put the best-practices into action. If you are in business to business sales, then you’ve likely encountered every one of these challenges and herein lays the best approach for navigating each one. I recommend this book very highly. Embracing these practices will generate more sales and more revenue by eliminating the obstacles and pitfalls that kill so many B2B sales. You can find The Seller’s Challenge on AMAZON.